Trace, bake, shrink and build your favorite characters in 3D! Classic Shrinky Dinks® with a new 3D twist! The new 3D Shrinky Dinks® kits come with 10 Shrinky Dinks Sheets (5” x 8”) and tracing sheets. Just follow the easy to use illustrated instructions and you’ll be making your own 3D fun in no time! BSW Toy inc. is founded by 4 owners who have been in the toy industry for a combined total of over 90 years experience. We are a fun loving distributor, designer, manufacturer of educational and non-violent toys. Our passion for toys is surpassed only by our drive to improve our customer service. We understand how frustrating some problems can be and we want to go that extra mile to make you happy. Come learn more about our family at our blog, twitter or our Facebook fan page! We’d love to hear what you have to say! We had such a great time with these. I remember Shrinky Dinks as a child so it was a lot of fun for me to tell my kids about them. However, we didn't have them in 3D so I was even more excited to try them out myself. Of course there were several sea animals to choose from on the template, but my kids had to pick the exact same ones. Too cute. After they each colored their animals, I cut them out so there wouldn't be any upset if someone accidentally cut off an animal part. Then I placed them on non-stick foil in the oven. It only took about a minute before they started shrinking up, it was so cool to watch. The kids were just marveled by it all. So after just about 3 minutes they were all set and ready to be taken out. We then had to place them in between some paper towels with a little pressure until they cooled. I just put a book on top of them. They cooled pretty fast. Of course when I went to put them together I realized that I didn't cut the stand notches quite far enough down like the template showed so they didn't go together. I just used my metal nail file and gently rubbed inside the notch and it worked great thankfully. So make a note to follow the cut lines exactly on the stands or they won't fit right. So that was it pretty simple and easy to do. They make pretty neat little stand up animals. The kids were begging to do the other animals just as soon as these were done. My only other suggestion is if you have more than one child you might want to photo copy the tracer sheet because there is only one and it's double sided. 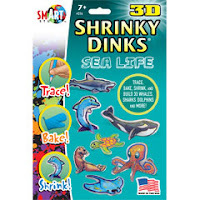 Win it: One lucky reader will win a set of Shrinky Dinks in 3D of your choice from BSW Toys. This giveaway will end June 4th at 10 PM EST. The winner will have 48 hours to respond to my email. If no response, a new winner will be chosen. Open to residents of the US. Mandatory Entry: (Mandatory entry must be completed first or bonus entries don't count.) *Tell me which Shrinky Dinks in 3D set you'd like to win. I'd choose the Fairy Princess set! I like BSW Toys Inc on FB. I would love to win the Fairy Princess Shrinky Dinks. I like the fairy princess ones! I like the train and tracks shrinky dinks 3-D set. I like bsw toy inc on facebook. I would definitely choose the sea life set. My kids would love the dinosaur set! we'd love to win the Zoo Safari Shrinky Dinks in 3D! I like the Fairy Princess Shrinky Dinks in 3D. Thanks. I would like the military aircraft shrinky dinks. I am following BSW on twitter. I am following BXW on fb. I would love the Fairy Princess set!! I'd like to win the pirate set. My 8 year old loves all things dinosaur so I definitely get the dino ones! My girls would like the princess shrinky dinks. My boys would love the military aircraft set. We'd like to try the Train and Tracks Shrinky Dinks. I follow BSW Toy Inc. on tw. I liked BSW Toys Inc. on fb. I would like to try the Space 3D Shrinky Dinks. I follow you on the Networked Blogs. I follow you on twitter. My id is Pippy37379. I follow BSW Toys Twitter. My id is Pippy3737. I like the Fairy Princess Shrinky Dinks in 3D! I Follow BSW Toy Inc. on Twitter! I'd like the Zoo Safari! I like the military aircraft shrinky dinks! I like the zoo safari set. I follow bsw toy on twitter as kmayans. I would like to win the Fairy Princess Shrinky Dinks in 3D. Space Shrinky Dinks in 3D. I'd love to get the Build-a-bot 3-D Shrinky Dinks for my little boy! Thanks for entering me!